They say puck luck is a staple of what makes great teams. 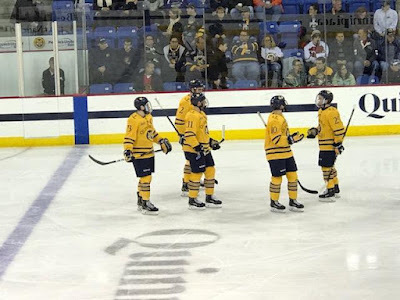 We don't know for sure if Quinnipiac is a great team yet as this season is just ten games young, but a 4-2 win tonight at Lynah Rink against Cornell gave the Bobcats another signature road win against the defending ECAC regular season champions and the team that swept them out of the ECAC playoffs eight months ago. A bizarre bounce off the back wall from a harmless Chase Priskie shot from the just inside the red line deflected off the back of Cornell goaltender Matthew Galajda for what turned out to be the game winning goal at the 10:18 mark of the third period. The game didn't start out on Quinnipiac's terms as just forty-seven seconds into the game William Fallstrom took a hooking penalty only to see Cornell's Morgan Barron blast one past Andrew Shortridge (21 saves) for the games first goal and the only scoring in the first period. Cornell's Beau Starrett was called for a five minute interference major against Desi Burgart which gave the Bobcats a golden opportunity. They capitalized not even a minute into it when Brogan Rafferty bombed a shot from the point past Galajda to even the score at one apiece. The momentum was short lived after Karlis Cukste took an interference call on the power play giving some four on four action. Cornell responded when Yanni Kaldis split the Quinnipiac defense and put one past Shortridge with a wrist shot in the slot to give the Big Red a 2-1 lead. Hamden native Joe O'Connor a natural defenseman converted to forward snipe a goal high past Galajda just 4:50 into the third period. That gave Quinnipiac the momentum until they got the Priskie goal. Alex Whelan's empty net goal capped the scoring to give the Bobcats their first win at Lynah Rink in two years. Andrew Shortridge played strong with some key saves at the right time as he picked up his third win of the season. Brandon Fortunato had two assists giving him ten on the season already. 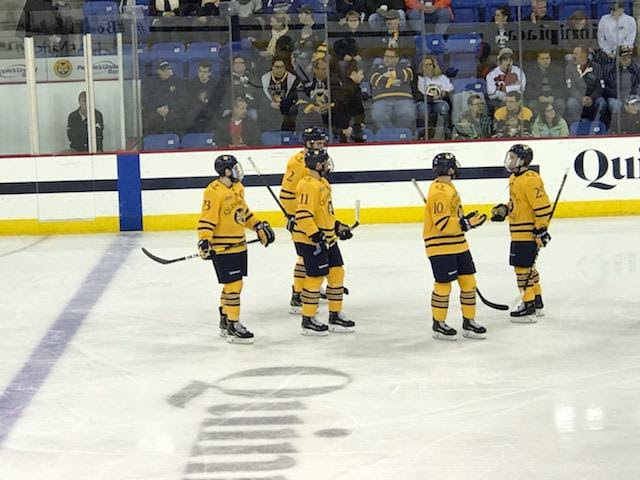 Quinnipiac (8-2-0, 3-2-0 ECAC) now travels to Hamilton, New York to face the Colgate Raiders on Saturday night as they look to go into the Thanksgiving on a high note.